Shaik Ismail, Director of International Programs, reading Field Notes from a Catastrophe: Man, Nature, and Climate Change, by Elizabeth Kolbert. 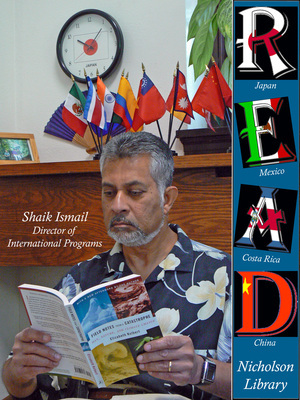 Terry, Paula and Nicholson Library Staff, "Shaik Ismail READ Poster" (2009). READ Poster Gallery. Image. Submission 55.